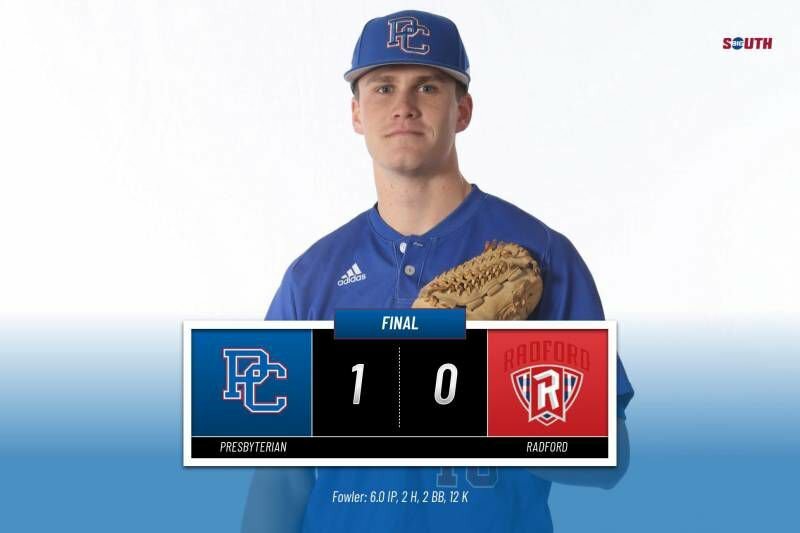 The Presbyterian College baseball team, behind a school Division 1 record 17 strikeouts, including a career-high 12 from Reagan Fowler, earned a 1-0 shutout victory over Radford on St. Patrick's Day at PC Baseball Complex. Sophomore Reagan Fowler was dominant on Sunday as he tossed six shutout innings, allowing just two hits and a pair of walks while striking out 12 Highlanders to earn the victory. The 12 strikeouts put him in a three-way tie for third in the Blue Hose D1 record book for single game strikeout performance. Bud Jeter in 2013 against High Point and Brian Kehner in 2016 against Campbell hold the record. Colton Springs threw three innings of shutout ball to earn his third save of the season. He struck out five in his three innings of work, allowing just one hit and one walk. In the sixth, PC got the offense going afterJonathan White drew a hit-by-pitch, which was followed by Jimmy Marcelli going the other way with a single to put runners on first and third with one out. Radford skipped one in the dirt that allowed White to come into score, and that was all the offense PC needed. The Blue Hose hit the road for a midweek matchup at Davidson on Tuesday night with first pitch slated for 6 p.m.. It is the first of three games that PC and Davidson meet this season as they play again in Davidson on April 16 and in Clinton on April 23. USC Upstate defeated the Blue Hose 9-2 in Spartanburg to conclude the first Big South series of the year. PC is now 7-19-2 on the season, 0-3 in conference play. Madison DeGennaro scored the lone run for PC in the top of the fifth inning. She reached base on a dropped third strike and moved up on the bases via singles by Jonnie Petree and Ansley Wilbanks. She scored when Casey Gerhard was hit by a pitch. The RBI was Gerhard’s ninth of the season. The Blue Hose will play a pair of non-conference doubleheaders this week before returning to Big South action. PC will travel to South Carolina State on Tuesday to play a pair and then return home to the PC Softball Complex to host Western Carolina on Wednesday. The first game of both doubleheaders are slated for 2:00 p.m.
Softball also fell twice on Saturday afternoon to USC Upstate. The Blue Hose dropped the first contest, 11-0, and then were defeated in the second half of the twinbill, 8-0. Alyssa Batastini took the loss in the first game against the Spartans. She is now 5-12 on the season after allowing seven runs (four earned) on five hits. She was relieved by Courtney White and Taylor Ward. White allowed a pair of runs on a hit and four walks. Ward worked the last three innings of the game, allowing two runs on three hits. Ward was called upon to start the second game in the circle for PC. She logged her third complete game of the season. The freshman is now 2-5 on the year. The Spartans collected 11 hits and eight runs in the contest. 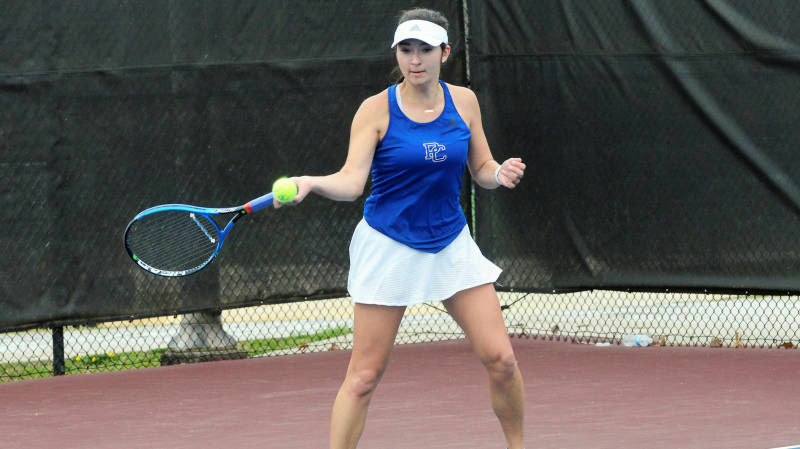 PC women’s tennis earned a hard-fought victory over Campbell on Saturday, 4-3. This is the first time PC has defeated Campbell in the Division I era. The Blue Hose moved to 2-1 in Big South play this season, 9-5 overall in 2019. PC began the day by clinching the doubles point. Beth Taylor and Katie Thompson did not lose a game on court number three in their victory. A win on court two by Samantha Calais and Jessica Leeman secured the first point of the match for the Blue Hose. Taylor and Calais were first pair of players to finish their singles matches. They each took straight set victories to give PC a 3-0 advantage. Campbell then stormed back and won each of the next three matches, leaving court six in the spotlight. Thompson, having already won a tiebreaker in the first set, was able to work her to another tiebreaker. She came out on top, winning her match and taking the match for the Blue Hose. The Presbyterian men’s tennis team was defeated by UNCG on Sunday afternoon, 6-1. PC is now 10-10 on the season. Oscar Alvarez picked up the lone victory for the Blue Hose on court three during singles play. The freshman won a pair of tiebreakers to earn a 7-6, 7-6 win. Jaime Castillo-Lopez split his first two sets on court four, but dropped the third set that was scored like a tiebreaker. The Blue Hose dropped an extremely close match to Campbell on Saturday afternoon, 4-3. Half of the singles matches made it to the third and deciding set. PC took the first point of the match in doubles play. The pairing of Daniel Stenger and Oscar Alvarez earned a victory on Bobby McKee Court to kick things off. Nicholas McKinney and Jonathan Bedard won their match on court three to clinch the point for the Blue Hose. In singles play, Jaime Castillo-Lopez earned a straight set victory over his opponent on court five to make the score 2-1. The Camels won the next pair of matches to take a 3-2 advantage. Alvarez, on court four, was able to win the twelfth game of his third set to earn the victory and tie the match. Stenger fought valiantly, winning his first set, but dropped his match and Campbell took the win. Maiken Bing Paulsen led the Presbyterian College women’s golf team with a 12th place tie and two-day score of 152 (75, 77) at the Low Country Intercollegiate on Sunday. The Blue Hose also finished 12th with a combined score of 637 (322, 315) at the par-72 Moss Creek Golf Club on the 5,836-yard course. Elizabeth Gore shot 162 (80, 82) to tie for 46th, while Serina Combs and Julie Hillestad tied 50th with scores of 163. Combs had rounds of 82 and 81, while Hillestad shot 87, 76. Taylor Gardner shot 166 (85, 81) to tie for 61st, and Caroline Martin finished 92nd at 195 (94, 101) while playing as an individual. Navy shot a final round of 297 to overtake Bethune-Cookman and win the team title with a 36-hole score of 600 (303, 297). However, the Wildcats’ Yudika Rodriguez hung on to win individual medalist honors at 144 (70, 74). Presbyterian College will next play at the UNCA Spring Invitational at The Cliffs at Walnut Cove from March 25-26.